Our rules require both sellers and buyers have a minimum of 75 posts to partipate in transactions and only in the For Sale/Where to Buy Section. As a wise Administrator once advised, "Let's keep it off the open forum and if you want to discuss, then keep it in Private Messages". Once it's outside of the For Sale/Where to Buy Section, it's just between the parties, thus the Administration here can't resolve any issues. 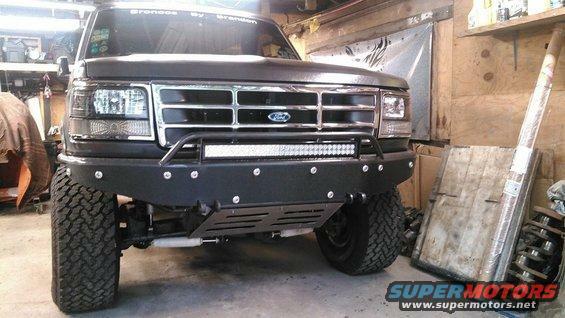 What are you looking for in a tube bumper? Solo Motorsports, Desolate Motorsports, Giant Motorsports all make tube bumpers for the front. They are more of the pre-runner style though. Mine is a Giant piece, with some extras added on to it from local shop. Any applications for 87-91 front bumpers? cant seem to find any. solo says its a preorder, but no clue on when. Blazen is out of business. A couple threads down. @silver70 is in the design phases, and it looks pretty good IMO. Thanks for the "plug" sir. My engineer and I have both gotten mired with year-end work at each of our respective full-time jobs and the looming holiday isn't helping, but the bumper is still on the "active" list. We plan to hit it hard after the New Year when the dust has settled. I'd like to have a final product by the time the FSB Moab trip happens. reptillikus and White Dragon like this. You have any pics of a prototype? I'm in the market for a new front bumper. Hopefully prerunner style seeing as it'll match my solo rear. Unfortunately it's not a pre-runner. Just a plate-style.